Enjoy Persian cookies and morning coffee while you forget all about Breakfast at Tiffany and explore the fascinating realm of oriental rugs. You are welcome to bring rugs for antique roadshow style appraisals. Mahmoud will advise us how to accurately assess the style, quality, and age before acquiring a rug for any location. He will also display a variety of samples from his own collection and discuss the defining characteristics of many different genres of rugs. Mahmoud will orally evaluate in detail any rugs brought in by attendees. The story of Jahann and Sons Persian Rugs is one of tradition, quality and art. A family owned and operated oriental rug business, Jahann and Sons began in the small town of Kashan, Iran five generations ago. In its first fifty years, its primary focus was the weaving and manufacturing of handmade Oriental rugs. When the business was handed down to Jahann, granddaughter of the founder, its retail side began to flourish. In the late 60s, Jahann’s sons immigrated to the United States, bringing with them their appreciation for the art of rug weaving – and their mother’s business. In 1977, the family business under its new name, Jahann and Sons, opened its doors in the Washington Metropolitan area. Mahmoud has spent his entire life in the rug business. He was born in Teheran, Iran to a long line of rug weavers and dealers. He spent his childhood working for the family delivereing wool to weavers and his teens, after movingto this country, selling rugs freelance. In the late 1970s, he was finally able to open his own shop...with just one rug in inventory. since then, the shop and inventory have grown dramatically. 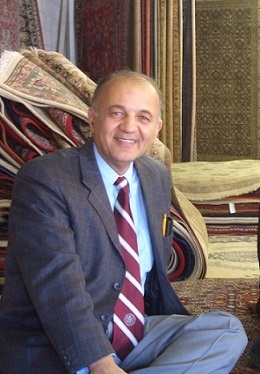 Mahmoud is a certified rug appraiser and member of the New England Appraisers Association. His expertise has enabled him to assist insurance companies, attorneys, estate appraisers, as well as countless families looking to learn more about their prized possessions.